The Pro Football Hall of Fame is taking petty to new levels after declaring they will not be announcing Terrell Owens' name during the ceremony. Now I agree with many people that Terrell Owens should attend his own Hall of Fame induction ceremony. It is a great honor to be recognized and it would great to hear him speak about his great career. But of course, this opportunity should have happened two years ago. Owens is one of the greatest wide receivers in NFL history and should have been a first-ballot induction. But he wasn’t. It was due to his reputation off the field that soured the voters which led to the wait. Owens understandably was not happy about being snubbed because of this. Even though his attitude during his playing days was not great, his skills and stats as a player are worthy of entry in first year. This is Eddie DeBartolo’s Hall of Fame speech. This was a speech we have been waiting for a long time. I personally love all the talk about family and that is what made Eddie D so beloved. But it’s that final story about how Bill Walsh prepared a gift for Eddie D for his induction into the Hall of Fame. It just showed how wonderful that bond was. It was spectacular. Watch the entire speech above. Eddie DeBartolo has got to get into the Hall of Fame this time, right?
. @49ers Edward DeBartolo, Jr. selected as Finalist for #PFHOF16 in contributor category. Needs 80% vote on eve of #SB50 to earn election. For years Eddie DeBartolo Jr. has been close to enshrinement into the Hall of Fame but has always been left out. I thought that his chances of getting in were getting slimmer. He’s been a presenter for some of the inductees and those men have called for his enshrinement as well. Now as he is a finalist for the contributor category, there is a good chance he gets into the Hall of Fame. He helped lead the 49ers dynasty with five Super Bowl titles and had such a major influence during that time period. When talking about owners in the NFL, DeBartolo is one of the greatest — if not the greatest. He made major contributions to the league and to the 49ers. The way he handled the team and the success is unmatched and I am still shocked he’s not in. But now with this news, there is a good chance. My blog post on the Baseball Hall of Fame induction ceremony is featured on the MLB.com blog. 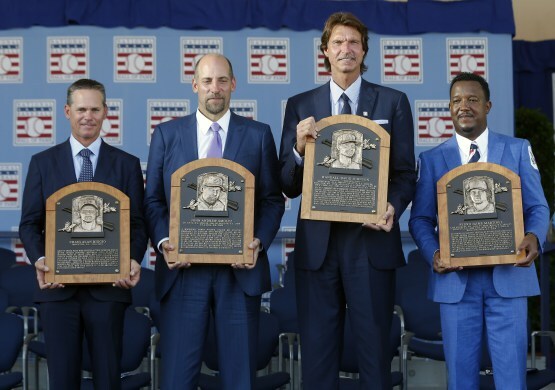 The Baseball Hall of Fame’s Class of 2015 was inducted on Sunday, and INSANE SPORTS posted a reaction. Another Girl with a Sports Blog shared her thoughts on the inductions and what they mean. 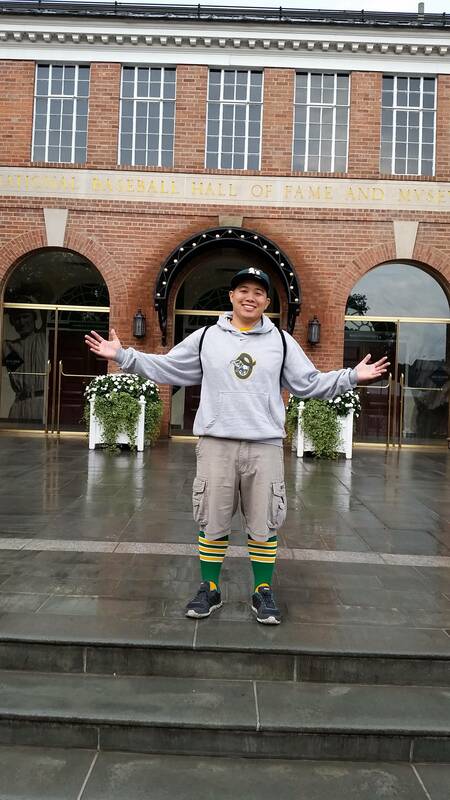 Chris Palmquist saw the enshrinement of some of the biggest names in baseball from his youth as a farewell to his childhood. MLB.com’s Tracy Ringolsby writes about Craig Biggio’s Mile High opportunity in his Write ’em Cowboy blog. Dan Hughes explores John Smoltz’s sudden 1991 transformation into a Hall of Fame pitcher at Baseball Magazine. Boston fan Bill Zeoli hailed Pedro Martinez as the best pitcher he’s ever seen, and he’s not alone in that belief. The problem with having a clueless millennial help you take a photo is that it’s not straight and it’s vertical. Oh well. Sunday was the whole reason why I made this trip out to Cooperstown. It was time for the induction ceremony for four players from my generation. I was so excited to make it out there but I was also running on empty in terms of sleep. It took me an hour to get to my lodging area and because the doors to the museum opened up at 7AM for Hall of Fame members (that’s me) I woke up at 5AM to prepare my checkout and drive to the Hall. But one benefit of that was that the parking was easy to find (and free) in the area right next to the Hall. It rained a little that morning but that wasn’t going to deter me. In fact, I just powered through the rain and made it to the Hall. It has’t changed much since the last time I was here in 2008, but they did have a few new things. One was the removal of the wall of balls from all the no-hitters. The new Hank Aaron exhibit was great. It even included the actual uniform he wore when he broke Babe Ruth’s home run record. There are so many things to see in the museum. The first floor features some cool artifacts from each of the new inductees but the highlight is still the hall of plaques. I didn’t get a chance to walk and look through all of them since I did that the last time I was here. But I did focus a little on some of the plaques that have been put up since 2008. It was an amazing experience just to see these plaques and walk through the halls of legends. The BBWAA has a lot of explaining to do. They punished Le Batard for “transferring” his vote to people who were not qualified, but it’s not like fans turned in the vote. Le Batard still had to fill in the vote and turn it in. Does it matter how he came to the conclusion he came to his votes? If it did matter, then we have a lot to explain about voters who have personal agendas that continue to have the right to vote. On Wednesday, it was revealed that ESPN’s Dan Le Batard had turned his Baseball Hall of Fame vote over to Deadspin to allow the site’s readers to fill out his ballot. He was subsequently stripped of his Hall of Fame vote “for transferring his Hall of Fame ballot to an entity that has not earned voting status.” This was pretty much the expected result for Le Batard. However, further review reveals that Le Batard wasn’t the first writer to get a little outside help with his ballot. It turns out that BBWAA vice president Jose de Jesus Ortiz of the Houston Chronicle has crowd-sourced his ballot for years, in a very public manner. Eddie D brought Hall of Famers to the 49ers. Now can he get there himself? If you haven’t heard the news, NFL Films will bring back their popular “A Football Life” documentary series this fall and on October 24, they’re doing a feature on former 49ers owner Eddie DeBartolo, Jr. This is a great thing as 49ers fans like myself have always been appreciative of Eddie D’s contribution to the team and his desire to win. The five Super Bowl titles under his watch is unmatched by any other owner in history. But as I was reading the press release, it occurred to me that this might be the final opportunity for Eddie D’s name to hit the national spotlight for his chance to get into the Hall of Fame.